If you're looking for a high-intensity workout that helps build speed, power, and cardiovascular fitness, stair running is ideal. Running stairs is also a great addition to any agility training program because it builds quickness and foot speed while providing an excellent sprint workout. 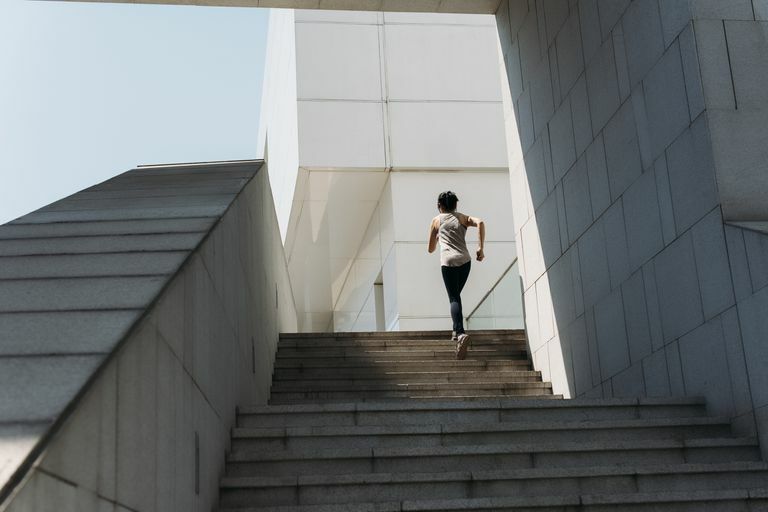 Running stairs targets some of the largest muscles in the body, including the glutes, quads, and calves—the same muscles used for lunges and squats. Stair running is a plyometric exercise, meaning the muscles exert maximum force in short intervals of time, causing the muscles to extend and contract in a rapid or "explosive" manner. Running up stairs also forces you to work against gravity, building strength and power." Stairs are much steeper than most hills, so running stairs will make climbing hills easier. Stair running accelerates your heart rate rapidly and makes you breathe faster to take in more oxygen. This, in turn, improves your VO2max—the maximum amount of oxygen you can use during intense exercise. A 2005 NIH study published in the British Journal of Sports Medicine showed that short bouts of stair-climbing five days a week for eight weeks improved VO2max by 17 percent in women. Another study, published in a 2016 issue of BMJ Open Diabetes Research & Care, found that walking up and down stairs for 3 minutes 60 to 180 minutes after a meal lowered blood sugar levels in people with type 2 diabetes. Many athletes run stairs at a stadium, but you can also look for a stairway in a park or other outdoor location or a stairwell in a building. If you don't have easy access to stairs where you live, be on the lookout for a hill with a fairly steep incline. Hill repeats provide a similar workout to stair running and may be slightly easier to get started with. And don't confuse stair running with using a stair climbing or elliptical machine. Running stairs requires more focus, more control, and more muscles to perform well. Plus, you don't have to join a gym or buy a pricey machine yourself. Find a good set of stairs and you're good to go. Make sure you warm up thoroughly prior to your stair running workout. Walking briskly on a flat surface for five to 10 minutes is a good way to get the blood flowing and limber up. Avoid running stairs on your first few workouts. Begin by walking up the stairs, one step at a time. As you build up to a jog, keep your weight centered with your head up and eyes looking forward rather than down at your feet. Add stair running into your workout routine on your high-intensity training days or as part of an interval training workout. In general, it's best not to do more than two stair workouts a week. Walking down the stairs may seem to be a breeze after running up them, giving you a chance to catch your breath. Going downhill also has surprising benefits on blood sugar, according to research presented at the American Heart Association Scientific Sessions in 2004. However, walking downstairs puts more strain on your knees and ankles than walking up. You hit the ground harder with each step. Often, it's the descent that causes the most post-workout soreness due to the eccentric nature of the muscle contraction on the way down the stairs. So if you are new to stair workouts, take it easy on the way down for the first several workouts. If you have significant knee issues, stair running may not be the right exercise for you. While stair running has many benefits, keep in mind that it is a strenuous exercise and may not be suitable for everyone. If you are wondering if it's safe for you, talk to your doctor before beginning a stair running program—and always stop your workout if you notice any aches, pains or other injury warning signs. How Can You Build Your Best Workout?